Beautifully engraved specimen certificate from R.R. Donnelley & Sons Company . This historic document was printed by the American Banknote Company and has an ornate border around it with a vignette of an Indian Chief. This item has the printed signatures of the Company's officers. RR Donnelley is a Fortune 500 company that provides print and related services. Its corporate headquarters are located in Chicago, Illinois, USA. The company, legally known as R.R. Donnelley & Sons Company, was founded in 1864 by Richard Robert Donnelley. His son, Reuben H. Donnelley, founded the otherwise unrelated company R. H. Donnelley. RR Donnelley's cartographic production facility in Lancaster, Pennsylvania grew to be one of the largest custom mapmaking companies in the United States. In the early 1990s, the division successfully integrated routing technology with its digital map databases and launched a separate company, Geosystems, which several years later became MapQuest. Throughout its history, particularly in the 1990s and 2000s, RR Donnelley purchased a number of other companies outright, steadily increasing in size. In February 2004, RR Donnelley merged with Moore Wallace Inc., keeping the name RR Donnelley as the name of the combined companies. Donnelley went on to purchase OfficeTiger, a major publishing and financial outsourcing company, as well as printing company Banta Corporation in 2007. In May 2007, RR Donnelley also acquired book and educational materials printer Von Hoffmann (and creative/ pre-press subsidiary Anthology Inc.) from Visant Corporation. An additional purchase at the beginning of 2007 was Perry Judd's Holdings Inc., a private catalog and magazine printer. At the beginning of 2008, RRD also announced the acquisition of Pro Line Printing, Inc. As of 2007, RR Donnelley is the world's largest commercial printer. In 2006 it acquired Canadian Bank Note Company's financial printing business, consisting of documentation for initial public offerings. In 2007, RR Donnelley was also named as an interested party in an attempt to purchase Quebecor World. In May 2009, the company tendered an unsolicited bid to purchase Quebecor World. In July 2008, the company established a multi-year contract with F+W Publications Inc., which will allow Donnelley to print a large amount of F + W's book and magazine publications. The contract is valued at about $80 million. In 2010 and 2011, RR Donnelley acquired Bowne & Co., San Francisco-based Nimblefish Technologies, Helium.com,[and Austin-based LibreDigital. During the Labor Day weekend in September 2011, RR Donnelly announced it would close its Bloomsburg printing plant where Penguin Classics and paperbacks in the best-selling Twilight and Idiot's Guide series were printed. On August 15, 2012, RR Donnelley acquired EDGAR Online. 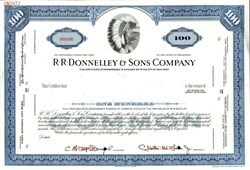 In 2013, RR Donnelly acquired Consolidated Graphics. The Lakeside Classics is a series of books printed annually, at Christmas time, by RR Donnelley. This tradition was begun in 1903 by Thomas E. Donnelley, who was then the company president. The basic format of these books has remained essentially the same since inception, as a hardcover, cloth wrapped and gold embossed. Subject matter tends to cover elements of American history. Many early volumes contained speeches and writings of noted Americans, including Benjamin Franklin, whose autobiography was published as the first Lakeside Classic. Lakeside Classics are never sold and are only made available to RR Donnelley employees, clients and others associated with the company. The week before Christmas, each employee is given one copy of that year's volume. As such, some of the volumes have become scarce, and are in demand on the collectors' market. Antiquarian bookstores often have a section devoted to Lakeside Classics, and early volumes command large sums from book collectors.